I recently requested a holiday something that I’ve done many a time before. Each time I’m asked to fill out a holiday request form, which is stored in a simple word document. Each time I’m left feeling frustrated at unneeded modifications I need to make to this document, but hey who cares about a holiday request form right? We have bigger fish to fry. In a world where were constantly battling to push out the perfect product & where everything comes with a cost, a silly little holiday form is not that big a deal right? Not quite, it’s upset me enough to talk about it here & whilst I don’t necessarily want to invest time changing something which still essentially works it does present an opportunity to learn. So with an opportunity available I presented my team with a challenge “Spot the usability issues with this document”. I was unsure at first how much of a go they’d give this, but I was pleasantly surprised by the depth of feedback and discussion back and forth we had about this which by all means was around a very simple request process that every company does. So let me place the scene of this document and how it’s handled in our company. 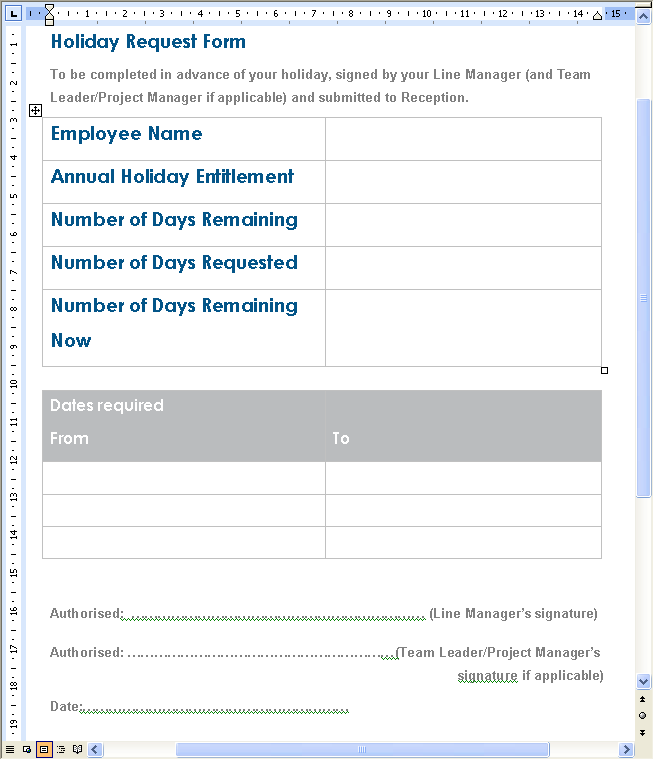 If I want a holiday I chat with my line manager & team lead to check that the suggested dates are ok before then proceeding to download (from a secure internal company intranet) & complete the request form. The form is then sent to our company secretary, who inputs the details into another system of which I’m unaware. Simple right? Being the good tester that you are you’ve probably already begun thinking about the usability issues with this, great! If not don’t despair that’s why an exercise like this is so good because it helps you learn together. So the feedback generally broke down into two main area’s: issues with the document & issues with the process. Every tester has a different approach to a challenge, some like to get caught up in the immediate challenge “the document” & some think of the bigger picture and look at the process. Some can do both, but generally everyone adds in their own perspective to it. Testers that were used to testing UI’s immediately spotted an alignment issue with one of the fields, everything was centered except for this one field which was left aligned. So if you like things to look nice as most people do you’d always have to correct this manually before printing out the form. A few looked at unneeded content most notably around numeric values which you’d have to do some maths for, surely the end system could do this automatically? Some found the form to be unclear and hard to read probing the design and if it best fitted with people reading patterns (left to right, top to bottom). Consistency being an issue with this as well. A couple of people felt too much knowledge was required prior to submitting it, what if I don’t know my holiday entitlement or days remaining? They also mentioned if two people had the same name this would present a usability issue for the receptionist. Talk around usability research prior to design, focus groups & usability evaluations for intended recipients where discussed. A few wanted the document to be electronic, cutting out the manual task of circulating it around. One also mentioned saving tree’s J Yeah you always get the one. One person noticed that the process required you to login, as the system already had your details then why did it not pre-populate anything? One person mentioned submitting incorrect data, how and when would you find out? Someone also felt sorry for the secretary being emailed all the time & asked “sorry… but how many days holiday do I have left?”, yup I’m guilty also! Whilst in the process of creating this post I learned that this holiday document had already been modified due to a usability issue. Here is an exact quote from my boss “Previously the “Employee Name” field was just above the table for Annual Holiday Entitlement, in grey and the same size as the description text. This was re-visited when 3-4 emails a week were being sent from the secretary to the entire company because yet another person had filled in the form and forgot to put their name at the top. Not only did the person who filled it out forget, but the two counter signatories didn’t notice either Since moving it to the table and making it blue, nobody has forgotten to add their name. “. Pretty funny huh? So what did I learn? Well I learned involving the rest of the team is a good idea, especially when it comes to usability testing. It’s not something you’d often do yourself without involving others, but like any other form of testing you don’t spot everything. I also respect my colleagues a lot more now, not just for participating but because of their input, their all smart people & it showed. So go ahead and do something similar with your team, challenges are fun & keep your mind sharp. If you spot something we didn’t let me know, like any other tester I’m keen to continue learning. On a closing note one of the funniest responses to this was to actually ask for the answer , this person being high D & I I should have seen this coming. Nice blog, Darren, and a good first couple of posts! It’s interesting to see what happens when you go to test the process that your software is supposed to be supporting. Sometimes the software is supporting a nonsensical process!